Between 2003 and 2008, government expenditure in PNG doubled. Between 2008 and 2015 it doubled again. But now the boom is over. Expenditure in 2015 is budgeted to increase by only 7%, or just 1.5% after inflation (compared to an annual average increase after inflation of 8.4% for the last five years). And then the cuts start. Total expenditure is budgeted to fall by a massive 20% after inflation between 2015 and 2017! The tightening of the fiscal screws might seem surprising given that the LNG project has just commenced giving a massive boost to GDP. But PNG has been running high deficits for the last couple of years. Now the Government has decided to cut the deficit. In fact, it must given fiscal responsibility legislation that requires a reduction in debt to 30% of GDP by 2015 from its current level of 35.5%. But the O’Neill-Dion Government has gone further than this with a commitment to eliminate the deficit by 2017. This does not seem like a credible promise. Will government expenditure really be cut by 20% in the run up to the 2017 election? Nevertheless, it does appear that the expenditure boom is over. Even if a balanced budget isn’t achieved for many years, meeting the 30% debt cap from next year onwards will be a significant challenge. It is budgeted to be achieved in 2015 only on the basis of a massive K2.5 billion asset sale. This is apparently the sale of the landowners’ equity share in the LNG project. But whether the landowners agree to buy equity they already in effect own remains to be seen. If they don’t, either the debt target will be blown, or there will need to be further expenditure cuts. And revenue growth is projected to be slow, despite the LNG project. Over the forward estimates to 2019, total revenue grows on average at slightly less than the rate of inflation. This year (2014’s) revised deficit figure is 5.9% of GDP, in line with the budget target. Many commentators thought the deficit would come in above that level; indeed the mid-year fiscal outlook released just a couple of months ago itself projected that the deficit would exceed its budget target . But the Government is extracting unusually high levels of dividends from its SOEs, and has apparently requested an early payment of dividends from the LNG project. Mining petroleum and gas dividends were originally budgeted for 2014 at K133 million, fell to zero in the mid-year fiscal outlook, but are now estimated to be K605 million. 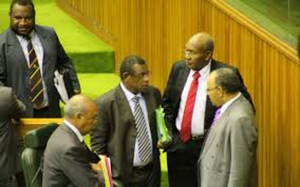 Aggregate expenditure is as budgeted, but there have been massive reallocations of expenditure through a K879 million supplementary budget, including another K250 million for the Pacific Games. Even with the increased revenue, the Government was not quite able to meet its legislated 35% of GDP debt cap for 2014 (the cap falls to 30% in 2015): as noted earlier, debt/GDP for 2014 is estimated at 35.5%. The 2015 deficit is targeted to decline to 4.4% of GDP or K2.3 billion, about K150 million below the 2014 deficit. 2015 revenue and grants increase by K1.3 billion or 10%. The main revenue increase in 2015 is an additional one billion Kina in mining and petroleum taxes on the back of those LNG gas exports. Projected increased revenue and a slightly reduced deficit give space for an extra one billion Kina of expenditure in 2015. There is a large increase in interest payments (up by K400 million), reflecting rising debt; and in the salary bill, reflecting recent pay settlements (about K300 million). The most striking, and single largest increase is for new District Education and Health Infrastructure Programs, with a combined value of K 445 million or K5 million per district. Little detail is given on these allocations, but if they are district funds, they will likely be under the control of MPs, as is the current District Support Improvement Program (DSIP) valued at K10 million per district (or electorate). DSIP funds have recently been the subject of a scathing report from the Auditor General, which found a “pervasive breakdown in the DSIP governance framework” and called for significant changes in accountability arrangements and expansion of capacity at the district level. Our own research on DSIP funding for schools and health clinics also raises questions about value for money: we found that almost one-third of all DSIP health projects were unlikely ever to be finished. We also found that schools are cashed-up through the large subsidy payments they now receive, and that many are already planning infrastructure investments with those funds. There are other funding increases in the budget which are welcome, such as to train and hire more teachers and nurses, and to purchase medical supplies and equipment. But how will these increases be sustained if the budget is to be cut by anything like to 20% in the next two years? In this context of fiscal stringency, the decision to increase MP project funds by 50% is particularly questionable. Stephen Howes, Carmen Voigt-Graf and Paul Flanagan are respectively Director, Fellow and Visiting Fellow at the ANU Development Policy Centre. Note: The development budget (Vol. 3) was not available on budget day, so we have refrained from commenting on the important subject of the relative size of the development and recurrent budgets. Watch this space for further analysis on this and other budget issues!